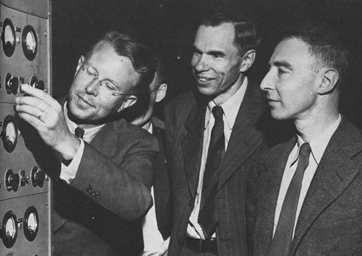 Lawrencium (Lw) was created in 1961 by Ghiorso, Sikkeland, Larch, and Latimer by bombarding three micrograms of Californium with Boron ions. The Lawrencium ions recoiled and embedded in a Copper conveyor tape which shuffled them to a series of solid state detectors. 8.6 MeV alpha rays provided evidence of the brief existence of Lawrencium. The half life was about 8 seconds! Lawrencium was named after Ernest Lawrence (1901-1958). He was born in Canton, South Dakota, and studied in South Dakota, Minnesota, and Yale Universities. He and Stanley Livingston invented the cyclotron at the University of California, Berkeley, in 1931. 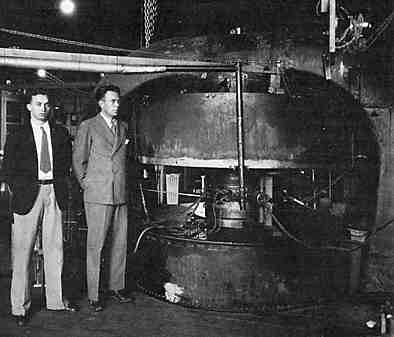 Lawrence's synchro-cyclotron produced the first man made mesons in 1948. His machines at what later was named the Lawrence Berkeley Laboratory have been used to make artificial atoms.